Sam: The Speedcross is Salomon’s best selling shoe and the best selling trail shoe world wide from what we hear. Prior versions have deftly crossed from trail use to more casual use. The Speedcross 5 represents a more aggressive performance take on the formula with yet deeper lugs, a somewhat narrower mid foot midsole geometry with a more pronounced bow between heel and forefoot, a blockier more supportive heel, and softer cushioning overall. Canice, Jeff & Sam: Substantially noticeably built up heel with a 10mm drop and a straight last makes ride less than ideal and tippy on non softer surfaces..
Sam is the Editor and Founder of Road Trail Run. He is 61 with a recent 3:40 Boston qualifier. 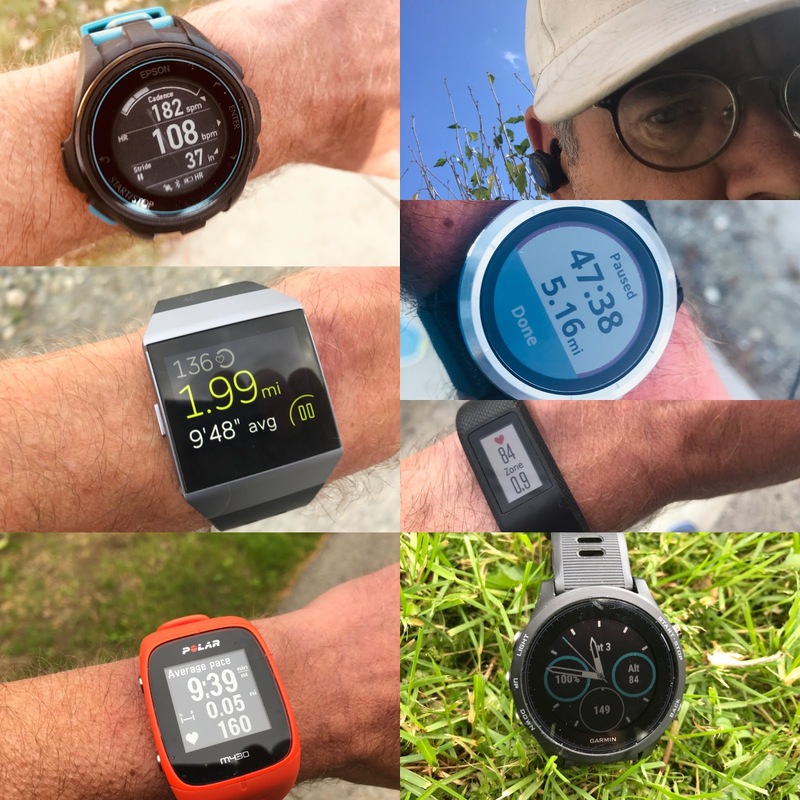 Sam has been running for over 45 years.These days he runs halves in the 1:35-1:41 range and trains 40 miles per week mostly at moderate paces in the 9 minute range on trails and roads in NH and Utah. He is 5'10" and weighs about 165 lbs. Canice is a 2 x finisher of the Wasatch 100, the Bear 100, Moab 100 and Western States 100 as well as many other Ultras.He regularly competes in Expedition Length Adventure races with his longest race to date 600 miles. Beyond ultras and adventure races, Canice has also competed in traditional road races and triathlons. 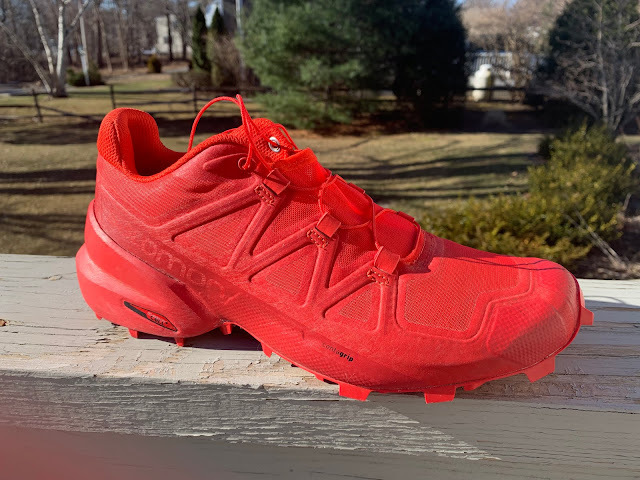 Canice: Having both worked for Salomon as the Sales and Product Manager for North America and now owning a running store I have personally tried every version of this shoe and helped many customers while they were trying the shoes on. Undoubtedly the fit of this version is more relaxed and the upper is softer and more comfortable than its predecessors. .
Canice: With that said I would describe the width as a medium last (fit) but if you’ve tried a previous version you’ll notice that your forefoot now has room to relax and your small toe is free to do as it wishes. Canice: Another thing that you feel as soon as you put the shoes on is the softness of the rubber used in the outsole. It instantly feels tacky and you’ll hear the suction of the rubber as it lifts off the floor. All in all my first impressions are an improved fit, fabric and sticky rubber. 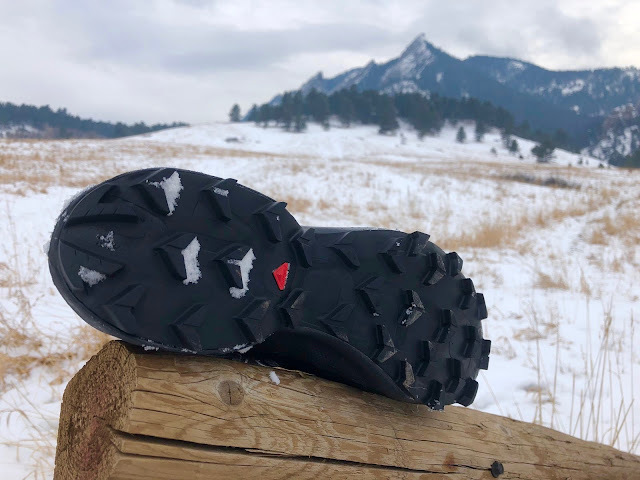 Jeff: Somehow, after 9 years of reviewing, I have not yet reviewed or even tried on a Speedcross, though I see them nearly every time I am out on the trails, or at least their distinct footprint in the mud or snow. I was struck at first by the overall burly, rugged, protective look, massive heel and aggressive, almost exaggerated tread. Stepping into them, I was immediately impressed by the well padded heel collar and tongue, forgiving midsole and relaxed, flexible, yet secure upper. Fit is true to size and fit is not necessarily wide, but accommodating and not the least bit confining. I find the all black colorway to be a bit plain and militaristic, however the other color ways look really nice and the red is particularly sporty looking. Sam: Along with Jeff I never have run a Speedcross. I was able to try a Speedcross 4 GTX on one foot and my Speedcross 5 on the other foot at my local running store. The 5 fit and last is fundamentally very similar to the 4 but...the softer upper materials and new vacuum molded overlays especially up front and in the toe box make the fit far more comfortable far and foot conforming. I have the bright red version. Striking, loud, and more aggressive for sure than my running but kind of cool, especially on snow. I wish maybe for a few contrasting hits of dark Jeff's black would blend in "off piste" better so you do have a choice. Canice: The upper is soft and supple yet comfortably holds your foot in place. 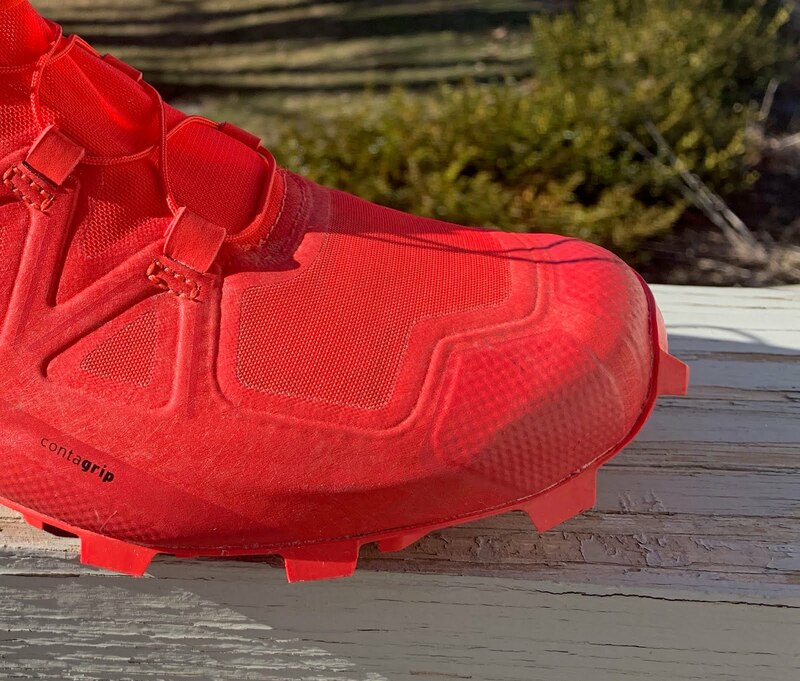 All this is due to what Salomon calls Sensi Fit (the triangular pattern you that connects to the eyelets) and an all welded upper that boasts not stitching. Canice: What I like most about the upper is how you don’t notice it or you don’t really feel it. Quite often you can feel the layers of a shoe or plastic bits and pieces but Salomon achieves a great feel here. In previous versions you felt protected but at times the upper was overly restrictive. Now you’re free to move and flex as you wish. 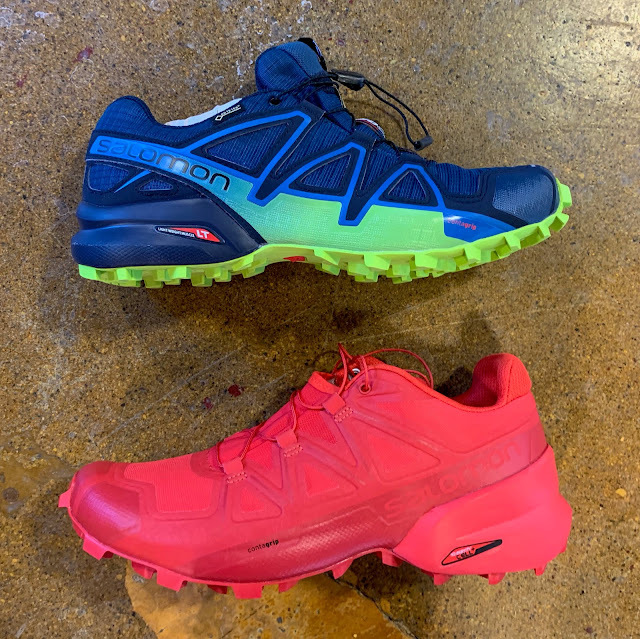 Jeff: The anti debris mesh upper is soft, flexible, breathable (while effectively filtering out dust and dirt), compliant and I think will accommodate a wider range of feet than many other Salomons. Even as accommodating and compliant as the upper may be, the Sensifit overlays and complete welded overlay construction provide a very secure hold over the midfoot without feeling confining or constricting. The synthetic toe bumper is moderate in thickness, but with good protection and integrates seamlessly with the rand that wraps 360 degrees around the shoe.. The tongue is well padded and protects from the thin and static Quicklace. 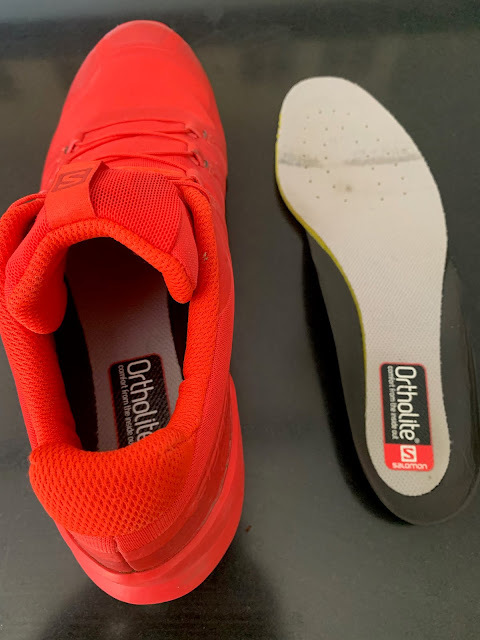 The Quicklace is very easy to use in this application and with only 4 sets of eyelets on each shoe, it is even more rapid, but still effectively secure. The Ortholite sock liner is dual density dual materials with an EVA type rear section and more conventional front. The heel collar is well padded and plush, a bit on the high side, but very comfortable and secure. Jeff and Canice have described the upper well. Comfortable, secure, and due to the vacuum molded overlays and toe bumper and soft thin and dense mesh strikingly all of a piece. It is not a broad high volume upper but for the use on soft uneven ground about ideal in its execution. While not a water proof shoe the extensive overlays along the lower upper for sure provide decent splash and snow resistance and even running in very cold temperatures I was never cold in this upper. Canice: The midsole of this shoe is supportive and comfortable and one you’re happy to run in or over anything that gets in your way. My knock on the midsole is related to the “ride” in that you really feel the 10mm drop. My natural preference is a 4mm to 6mm drop and I tend to find myself running most in a 4mm. Lacing up a 10mm drop I really feel the heel under foot. The foam is comfortable and there are good arguments for having a higher drop in your shoe but given this is a trail and offroad animal it surprises me to find it here. Canice: But it judging by the midsole alone, the material is great and it has plenty of cushion. Jeff: The Energy + midsole with Profeel film in the mid foot provide a high level of firm, yet comfortable all day cushioning and protection from sharp rocks underfoot. Response is moderate at best, never really nudging to go fast, but can handle short stints of speed. With 30mm in the heel and 20mm in the forefoot, there is a distinct “high heel” feel to the Speedcross 5, which will be welcome (or go unnoticed to most), or be a detriment to those looking for high performance. I generally pride myself in the fact that I am quite flexible with shoe drop, not very often caring what the drop of a shoe might be as long as it overall is a shoe that I like and works for me. I also typically assert that on technical terrain, drop is much less of a concern. I still hold true to that, but I did find it somewhat easier to find and surpass the limits of Speedcross 5 in technical terrain and off trail use, particularly on rough, steep, off camber sidehilling and sometimes when rock hopping. 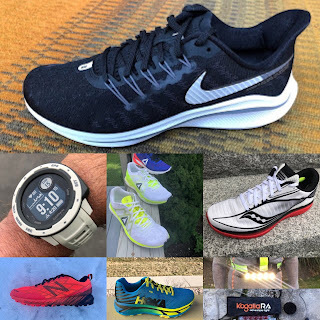 The heel just feels a bit too high (compounded by the very tall lugs) to offer the control, ground feel and stability that I prefer at higher speeds and more spirited running in technical terrain. This is not a knock however, just more of a noted limitation depending on your use/preference. 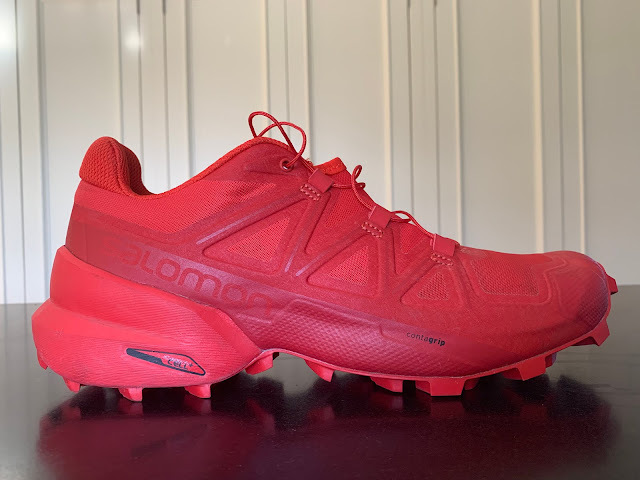 Sam: The Energy+ midsole (and outsole) is on the softer side of Salomon trail shoes particularly with the 30mm stack heel. I was surprised, especially in comparison to the Chadwick Mountain Racer how forgiving if a bit awkward due to the giant lugs it was to run on roads. Particular note must be made of the aggressive bow upwards (photo above) and narrow width (photo below compared to Speedcross 4) under mid foot of the stack. This geometry does create a sense of a blocky heel with the 10mm drop also in the mix. The height is visually exaggerated as the foot at the heel sits down about an inch surrounded by the outer midsole walls for support and stability at the rear. The combination of blocky heel and very decent front flexibility the SC5 is clearly designed for climbing and descending on soft ground such as looser snow and mud and not for precision work on rocks or more smooth trail running. Canice: The outsole is the star of the Speedcross line and the new and improved outsole on the Speedcross 5 takes it to the next level. You’ll find this platform everywhere from an elite trail runner, to a special operator deep in country, to your local softball league and most likely in the grocery store or at your favorite cafe. Canice: The deep lugs scream traction and here in Utah this is one of our go to winter running shoes as it grips the snow beautifully. 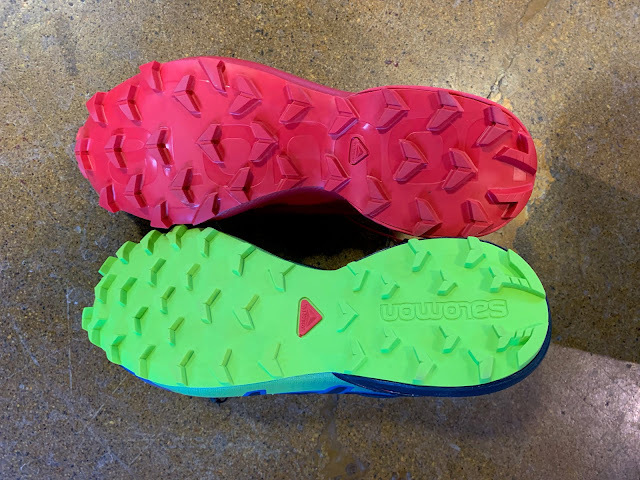 The nice thing about the updated outsole is it has even more grip with the new softer rubber and doesn't slide when you step out onto a rock or off a tree root. Canice: When running road I do feel the lugs. It’s not bad and I’m usually doing this just to get to the trail but I would not want to wear this on hard surfaces for long. Jeff: The Contagrip TA outsole with classic Salomon Chevron directional lugs look to be an almost cartoonish exaggeration of an all terrain trail shoe. Traction/bite into softer surfaces like mud, hard packed snow, dirt, loose duff and off trail chaff is unparalleled, providing confidence inspiring grip. I find the TA rubber to be harder (for durability, particularly tall lug durability) than the Premium Wet Traction Contagrip, found on the XA Elevate for example and this harder rubber is less sticky on rock, particularly wet rock and other hard, wet surfaces. In addition to the rubber being less sticky, the tall and widely spaced lugs do not provide a lot of surface area to adhere to on a hard surface, as is more the case with a lug pattern such as the outsole found on the XA Elevate. When running on trails that were intermittently wet, snow, mud, then stretches of slabby rock or even just a single angle rock step, I found myself slowing down in order to not break the shoe loose after taking a few minor slip/slides where I had otherwise presumed the shoe should stick. Again, not necessarily a complaint as it is guidance as to where the Speedcross 5 is most effective. Sam: The outsole proved outstanding, the best of any I tested this winter on snow, from loose to firmer. The bite and traction was noticeable and totally secure. In comparison to the Speedcross 4 (left above) the lugs are clearly more massive with additional lugs placed at the narrow waist at mid foot. This is clearly a specialized outsole for softer ground and yet more so than its predecessor. On frozen mud the outsole was OK but tended to get in the way, catching small trail obstacles and not contouring particularly well. Canice: I like the ride but it has a lot of build to it so you loose ground feel. For some this is a huge plus and for others it’s a negative, so just know going in that it has a structured ride. You’ll also notice your heel is elevated and though this is something you get used to, and in all honesty most people don’t even notice, it’s definitely something you’ll feel. Generally speaking the ride is good to really good with lots of support for your feet. 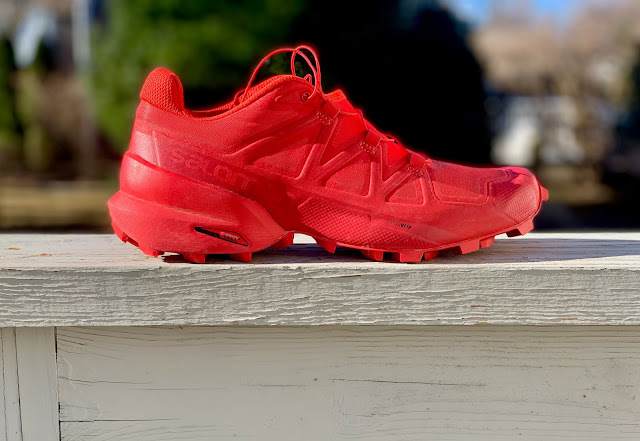 Jeff: The ride of the Speedcross 5 is smooth, supportive and protective and is a workhorse shoe for long days on rough terrain, but definitely no speedster. 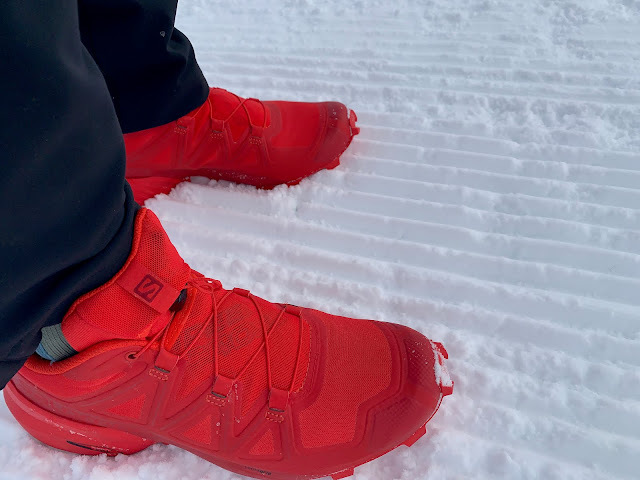 Sam: The ride is tuned to softer terrain and to steep ascents and descents given the aggressive traction, very stable heel, front flexibility and secure upper. They were outstanding to run on snow. Canice: If you’re looking for a soft comfortable shoe with traction for days, then this is your shoe. The fit is now relaxed from where it was but I would still describe this shoe as a medium last. These are best suited for softer terrain. On a personal note I run this shoe all winter and love every mile in them. This shoe is incredibly well built, soft, comfortable and has insane amounts of traction. My knocks on the shoe are representative of my preferences and not reflective of the shoe itself. Remember, this is all subjective. Jeff: I am impressed with the Speedcross 5 and though I have not tried previous models, I think that this version is a worthy follow up to the previous. I better understand now why this shoe is so popular with the masses and will be even more so with the release of version 5. The Speedcross 5 provides excellent fit, comfort, protection, traction, durability, ease of use (quick on/off with the Quicklace) and style. 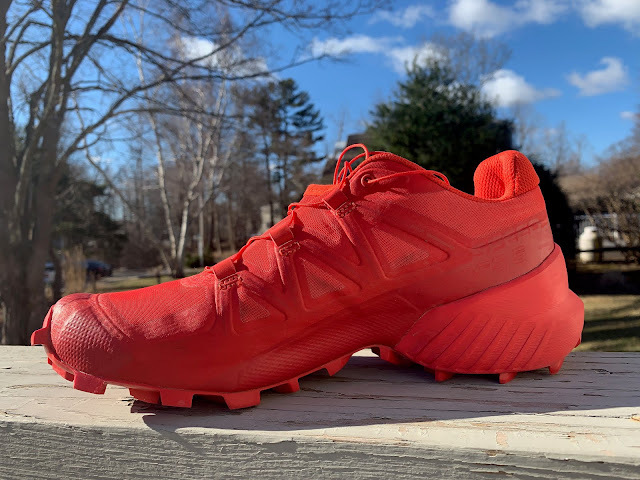 They are best suited toward moderate to slower paced running or hiking, long days, where comfort, traction, protection and support take precedence over high speed and maximum performance. -0.2 for such a tall heel/10mm differential, as I think similar cushion/protection could be achieved while maintaining a better sense of stability in technical terrain. -0.1 for wet traction on hard surface. The Speedcross 5 is an outstanding choice if your runs take you "cross country" through mud, snow, and other sloppy terrain. A somewhat more specialized shoe to those conditions they are fine on other terrain but would not be my first choice. Their almost cartoonish aggressive look is not just for show but integral to their purpose. The upper is one of the best yet on a Salomon for its smooth, comfortable fit. -0.5 for huge lugs which while outstanding limit terrain versatility. Jeff: The XA Elevate is slightly lighter and though still stiff and protective, has a lower center of gravity for better ground sense and stability. The SC5 is more plush and better cushioned and also has a more forgiving upper for a wider range of feet and all day comfort. SC5 has better soft ground traction, where the XA Elevate has superior overall traction, particularly in the wet. Sam: Agreeing with Jeff 100% and adding the Elevate is a more versatile shoe which while it may not climb steeps quite as well as the more flexible Speedcross is a better all around choice. Jeff: A logical comparison, but two very different shoes. Traction is comparable, but the similarities stop there. The SC5 is more cushioned, padded, comfortably accommodating and reasonable for long days, where the DV Racer is lower, more stable with a more precise fit for higher performance use, also the DV costs $100 more for the hip styling. 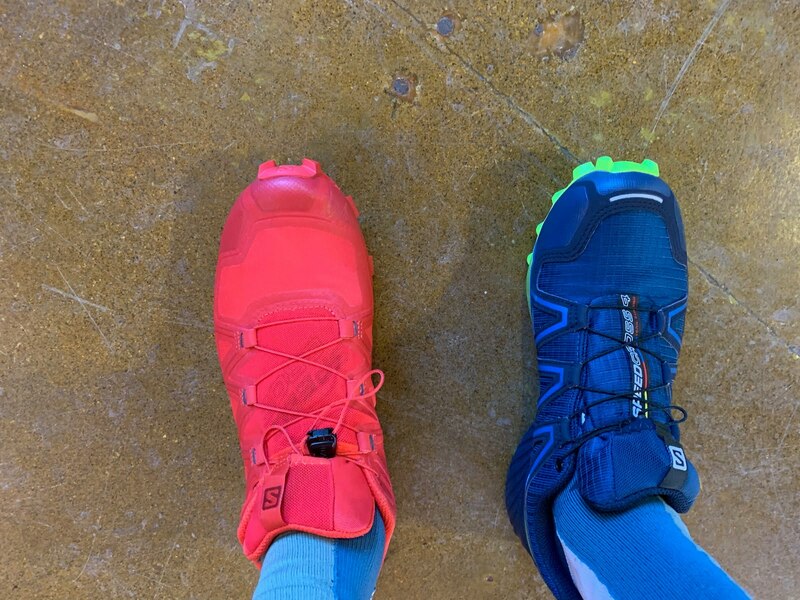 Sam: Stiffer, far firmer, a technical scrambling shoe the District vs. a soft ground specialist for the Speedcross. Jeff: Both shoes offer maximum deep tread for excellent traction on soft surfaces. 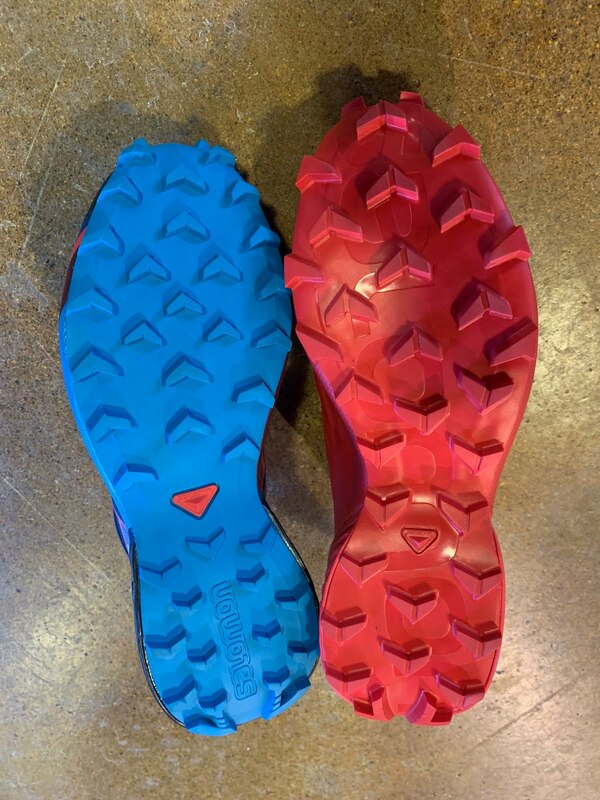 The Mutant has a more precise (and at times, somewhat confining feeling) upper and the rubber is more sticky for all around better traction, particularly on rocks, wet, slab, etc… SC5 though is much more protective, better cushioned and more friendly for the average user with an accommodating fit and overall comfort. Sam: I prefer the Mutant's more stable and versatile platform although do agree with Jeff's its upper is somewhat confining at mid foot. Jeff: Both shoes offer great protection, soft ground traction and durability. Trail/under foot feel for both shoes is comparable, but the Akyra weighs more and is closer to a low hiker than a trail runner. THE SC5 fit is slightly more accommodating and easier to use with the Quicklace. SC5 has better soft ground/snow traction with wet hard surface traction similar. Jeff: Both offer excellent protection, traction, durability and refined, compliant upper. The Peregrine has more versatile overall traction, better in wet conditions and is lighter with much better response. SC5 would likely be a better choice for slower, longer days, though either would work great. Peregrine ISO for better performance and faster running. Canice: There are several shoes in the market that line up against the Speedcross so if you’re shopping around, checkout the Inov8 collection as almost all of their shoes have aggressive traction. The La Sportiva Akasha or Akyra are other great shoes to compare against the Speedcross and try the Peregrine ISO. I suggest all these shoes based on their aggressive traction.